Cook 3 cups of dry Fusilli pasta as per directions on the package. Drain and set aside. Brown 1 1/2 lbs of lean ground beef. Season with 1 tablespoon each of onion and garlic powder, 1/2 teaspoon each of basil , oregano, salt and black pepper. Add 1 white medium onion, chopped. 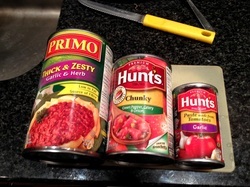 Add 1 can (14 fl oz) of Hunt’s Chunky Tomato sauce (with green pepper, celery and onion ) in it. Add 1 Can Primo Thick and Zesty Garlic and Herb sauce and 1 small can of garlic tomato paste . Stir and let simmer on low for about 10 min, stirring a couple of times. Have 2 Casseroles dishes ready, sprayed with NON Stick Spray. and a layer of Kraft Shredded TEX-MEX Cheese (or shredded mozzarella cheese). Repeat. Add one last layer of sauce and cheese to each casserole dish. Put in oven at 350F for 10 minutes covered, then 10 minutes, uncovered. 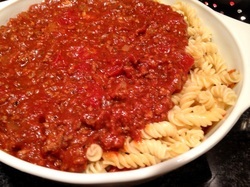 When done, serve with Parmesan cheese on the table if you want to sprinkle some on top . You will have one Casserole to eat, and one to keep for another meal. Leftovers can last 3 days in fridge, and it also freezes well. To reheat, place in 350F oven until heated through.